Do kids want to learn about acids and bases? If they’re like my kids then probably yes in theory – but in practice, “Not right now, thanks Mummy, I’m just finishing this game on Grid Club/making this cardboard helmet/playing my guitar”. 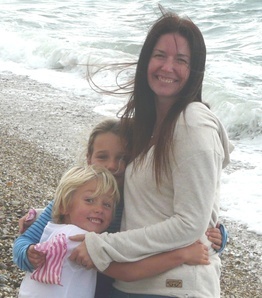 Do kids want to play with colourful potions? Absolutely! And once you’ve ignited their curiosity, of course they’ll want to know all about it! Roughly chop the cabbage and boil it in water for about 10 minutes. Drain (and discard/eat) the cabbage, reserving the water. Pour the water into as many jars/glasses as you have substances to test, plus one as a control. Add one substance (e.g. lemon juice) to each jar of purple cabbage water. Label the jar so you don’t forget what you’ve added. Observe any colour change, comparing against the control cabbage water (to which nothing has been added). The water the cabbage has been boiled in is dark purple. 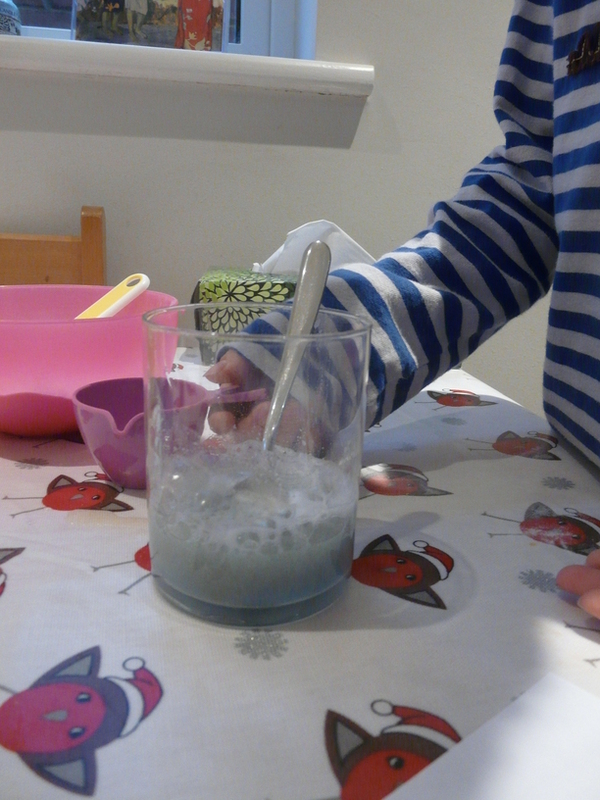 C and J both chose to add vinegar to their first jar, which turned the cabbage water a pinkish colour. Then they predicted (proper science!) what would happen when they added lemon juice, and were happy to confirm their hypothesis that lemon juice also turned the water pink. The effect of adding bicarbonate of soda was more subtle. We had to scoop up a small amount of the liquid with a teaspoon to fully appreciate the change – the water took on a blueish hue. Soap turned the water very slightly blue, and soy sauce had no noticeable effect. What we forgot to try (there’s always something!) 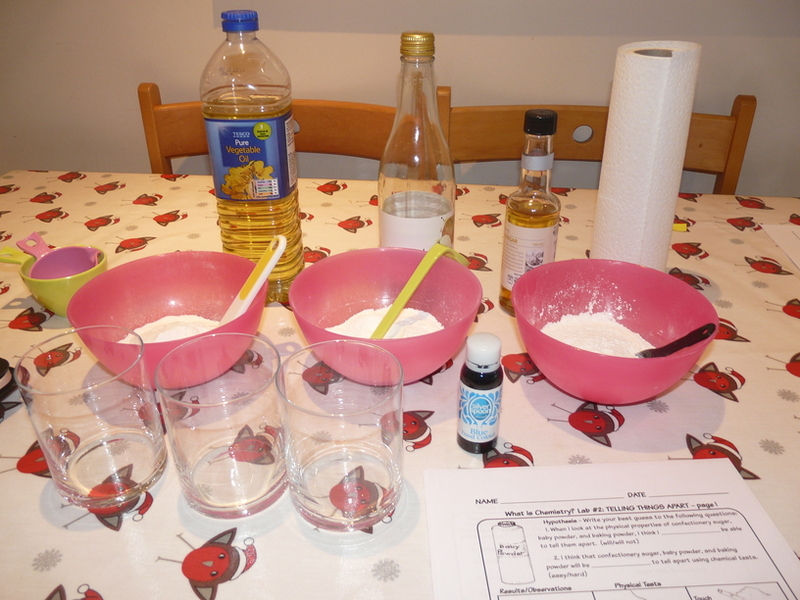 is adding vinegar or lemon juice to our bicarbonate of soda water. If you get the quantities right, this should turn the water back to the original (purple cabbage) water colour. A base is the chemical opposite of an acid. Bases produce negatively charged particles in water, called hydroxyl ions…. For this you’ll need a pack of pH-testing litmus paper (£2.76 on Amazon). I gave the children a book of litmus paper and they dipped a fresh piece in each of their cabbage water jars. They compared the colour the paper turned with the colour scale on the book, to obtain a pH value. I explained that pH is a measure of the acidity or alkalinity of a solution. (Bases that dissolve in water are called alkalis.) Acids have low pH’s, alkalis have higher pH’s. C noticed by testing with litmus paper that our soy sauce solution was very slightly acidic. Has anyone else tried this? Do leave a comment to let me know how it went or if you know of any other fun experiements with acids and bases! Thanks to Adventures In Mommydom for hosting Science Sunday! We jumped into practical chemistry today with this experiment from Wholly Irresponsible Experiments. As soon as the end credits on the documentary began to roll, J jumped off the sofa and headed towards the bathroom, blithely announcing he was “off to make some potions”. Remembering that a similar impromptu potion-making session had got through the large part of a £35 tube of my Laura Mercier foundation, I quickly grabbed Wholly Irresponsible Experiments and began setting up this easy and fun experiment. 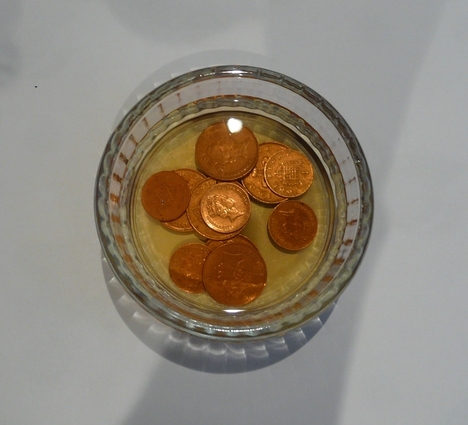 Put the copper coins into the bowl so that they are completely submerged. Put the nail into the bowl. Notice little bubbles begin to form on it. The nail comes out copper coloured! 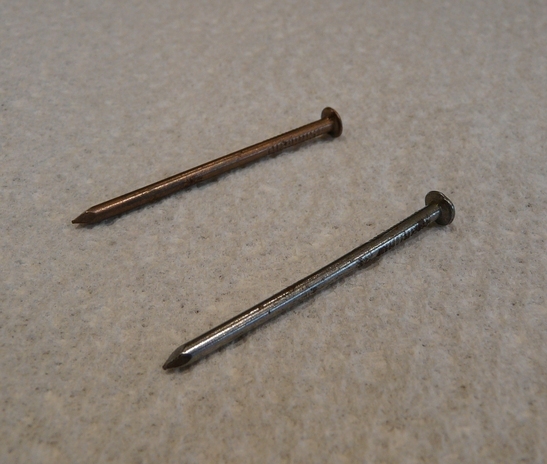 If you have a second nail you can compare the two. 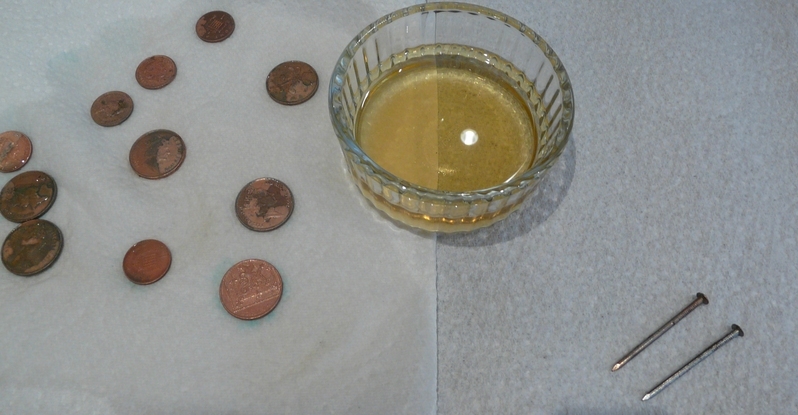 Copper from the coins goes into the salt and vinegar solution and attaches to the nail, producing a copper-plated nail. For more on the science see this site. A resounding success. Fast, easy and very cool! It’s time to get more hands-on in our science. Last term we followed REAL Science Odyssey’s “Life” curriculum; C and J loved making jelly cells and blood, acting out red blood cells moving around a giant’s respiratory system, and learning about human digestion and bones. But since the Life curriculum had moved onto worms and molluscs their interest was beginning to wane, besides which it’s entirely the wrong season to be hunting snails or waiting for butterflies to emerge from chrysalises. The upshot is, we’ve put our half-finished animal kingdom lapbooks aside for now and dived into chemistry! 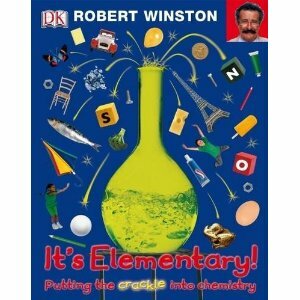 I spent a weekend thumbing through some chemistry books on our shelves – Robert Winston’s It’s Elementary! 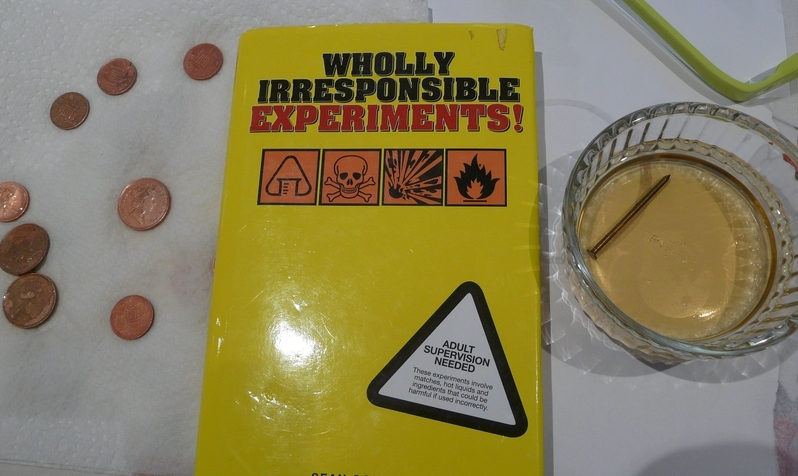 Putting The Crackle into Chemistry and Irresponsible Experiments – and the REAL Science Odyssey Chemistry curriculum I’d bought in the last Pandia Press sale. 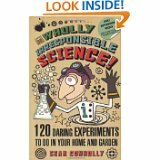 “It’s Elementary” is wonderful but doesn’t offer much in the way of hands-on science, and “Wholly Irresponsible Experiments” is full of fun activities, but from experience I know I need to be guided by some sort of curriculum otherwise all that fun hands-on stuff tends to fall by the wayside. The RSO chemistry curriculum is very rigorous in its application of the scientific method and contains lots of practical activities. The worksheets are mainly geared to older children, so we’re going to focus on the experiments, backed up with plenty of discussion. We’ll still follow the scientific method –hypothesis, observations, conclusions – but my overriding intention is to get the children excited about science! First we used our physical senses to examine the powders. The children loved it. 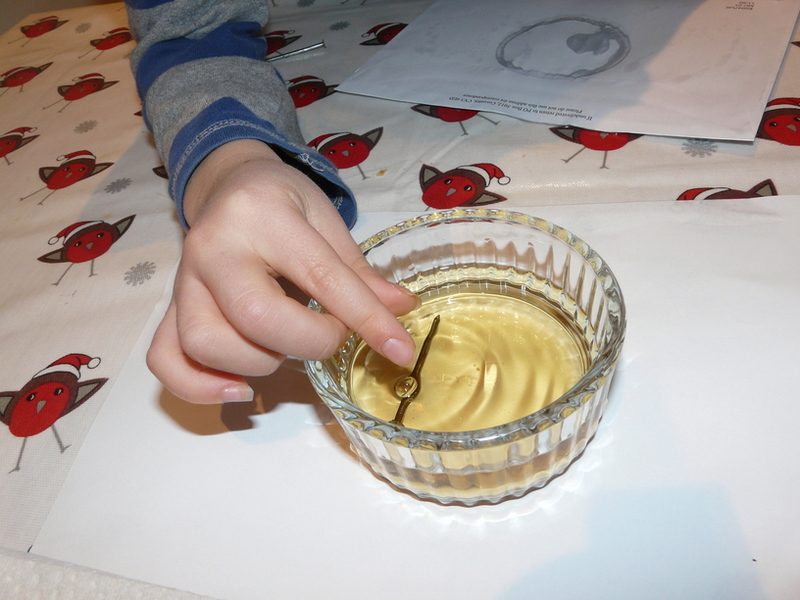 J was especially delighted to have chosen to administer the test on baking powder, which fizzed very gratifyingly when vinegar was added to it! 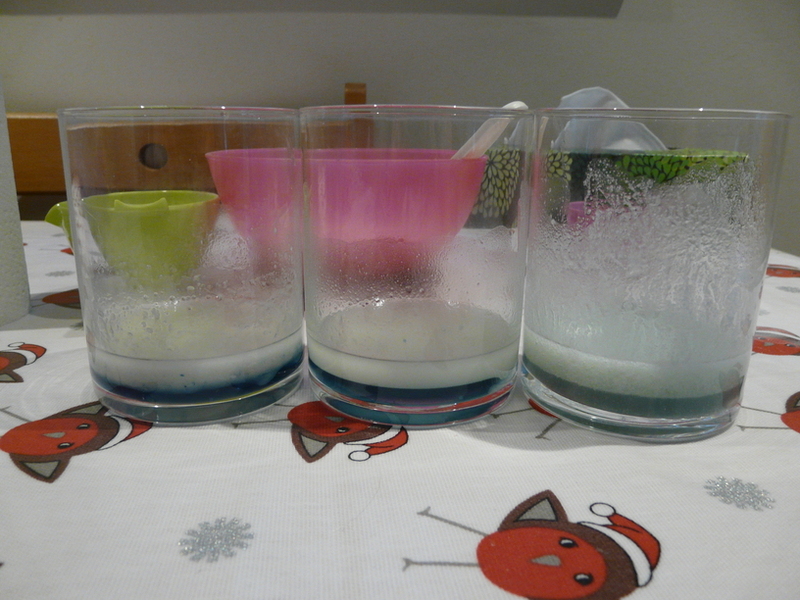 Although they started out very enthusiastic, by the end of the experiment the children were a bit weary – there were a lot of tests, and they had to wait while I washed up the glasses in between each one. If I were doing this again I would probably spread it over more than one day or leave out some of the tests. Science works best in bite-size chunks in our house at the moment. The RSO Chemistry curriculum moves on next to a discussion of atoms and then introduces the elements. Before we go onto that, I’d love to find a good living book on the history of chemistry. It took a long time for alcehmists-turned-scientists to discover that the world is made of elements, and the story of how they did is fascinating, as I found out when I recently watched the BBC documentary Chemistry – A Volatile History. Wouldn’t it be fun to learn about atoms and the elements as the final piece of a detective story that puzzled great minds for centuries!